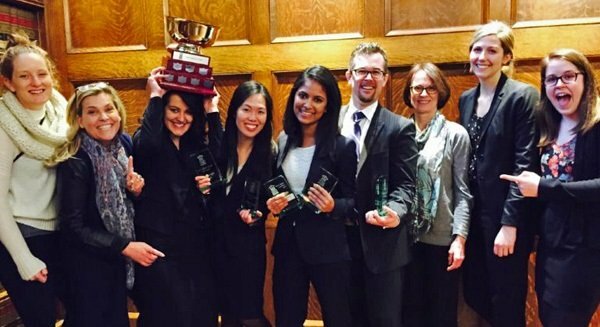 Martha McCarthy & Company LLP would again like to congratulate the University of Toronto Walsh Family law Mooters on their spectacular results!University of Toronto Law had another year of great success at the Walsh Family Law Moot. U of T, represented by Rachel Kattapuram, Petra Molnar Diop, Amy Tang, and Graham Thomson came in first overall. Graham was named top oralist (with a perfect score!) Rachel and Amy tied with Manitoba for best respondents’ factum. The team made submissions before the Supreme Moot Court of Canada on two thorny issues of property division under the Family Law Act: (1) the valuation of fixed debts under bankruptcy, and (2) the court’s power to set aside a single, mistaken provision of a settlement agreement. For the first time the Family Law Moot included a Negotiation component. Christophe Shammas and Aoife Quinn comprised our negotiation team and did very well in their pioneering role.